Cruising on Rend Lake last weekend we got into a school of Yellow Bass. Since we were running spider rigs as well as one guy single pole jigging, it was really exciting for a few minutes. There were fish on as many as three lines at a time. As quickly as it began the action was over. This small member of the bass family is a pan fisherman’s dream. It grows to a good size for a pan fish. It is large enough to fillet, is good eating and a hard fighter. The yellow bass reproduces readily and you can catch them by the dozens with no danger to the species. Yellow bass are members of the Percichthyidae family that includes white perch, white bass and striped bass. Other names for yellow bass are barfish, stripe, streak, streaker and brassy bass. It resembles the white bass with a forked tail and compressed body. The longitudinal stripes (6) of which there are three above the lateral line and three below it. The lower three are not solid as with white bass. Other differences from white bass are the lack of teeth on the tongue and the lower jaw does not protrude beyond the upper jaw. Yellow bass have an olive green back, white belly and sides that are brassy to gold or silver. 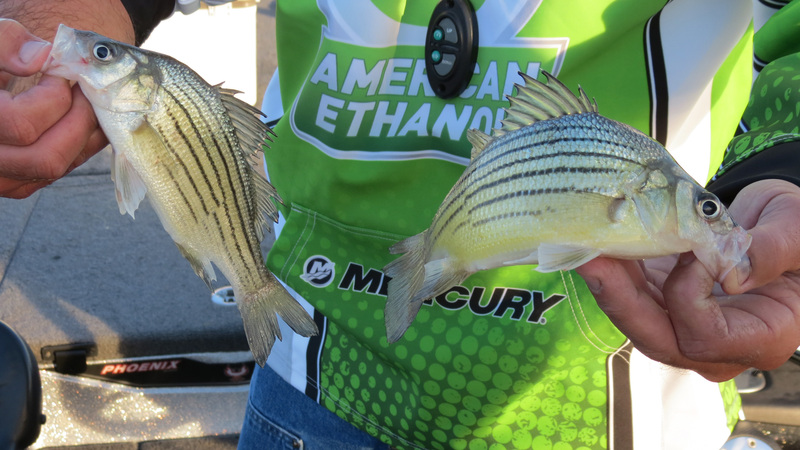 When sides are silver they are often mistaken for white bass. Generally 8 to 11-inches in length, yellow bass are not big in the weight classes. The world record is probably just over 2-pounds. Anything in the 2-pound class is a giant. Most weigh less than 12-ounces. All of ours were less than a pound. The life span of this fish is 3 to 5-years. Those that are 2.5 to 5 inches in length are yearlings. By the third year of their life they have reached a length of 9-inches and change their feeding habits. Prior to this point they feed on insects and small crustaceans. Later they change to feeding on small fish. This accounts for their delight in taking our jig and minnow combinations. Slip bobbers, jigs, twister tails and small spinners are effective in catching yellow bass. The best live bait seems to be 2-inch minnows. Other live baits include such things as wigglers, waxworms, spikes and pieces of nightcrawlers. The jig/minnow combo is the most popular rig. Small jigs are best. The most popular are 1/32nd to 1/16th ounce jigs. Ultralight tackle or long poles seem to be the ticket for getting in tight places popular with yellow bass. Two to 4-pound test line is best. Yellow bass are usually rather dormant during winter months. In early spring they become more active on through until fall. As the water temperature reaches 60-degrees the bass begin to spawn and are in the shallows over gravel beds, stony structures or other structure. They are always hungry and put up a great fight. The best time to fish for yellow bass is early morning and late afternoon. Adult fish cruise deep during the day and then head for the shallows to feed. Yellow bass are a meaty fish even if they do not have length. Do not hesitate to keep and eat these fish. They are prolific and are better eating than white bass. In fact they taste something like a bluegill.